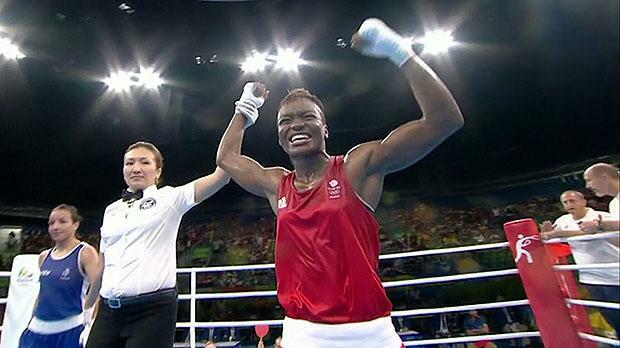 Nicola Adams became the first British boxer to retain an Olympic title for 92 years by winning gold in the women's flyweight final at Rio 2016. The 33-year-old won a unanimous points decision to beat France's Sarah Ourahmoune. Britain have now won 26 golds in Brazil and 63 medals overall, two short of the record 65 won at London 2012. It is GB's first gold boxing medal in Rio, though super-heavyweight Joe Joyce could add another (Sunday, 19:15 BST). "The gold rush continues," Adams told the BBC. "I'm now officially the most accomplished amateur boxer Great Britain has ever had. I can't believe it." Adams, from Leeds, has won Olympic, European and Commonwealth golds and now becomes the first Briton to defend her Olympic crown since middleweight Harry Mallin in 1924. She started strongly against the 15th-ranked Ourahmoune, winning the first of four two-minute rounds on all three judges' scorecard. She improved further in the second, again winning across the board after pinning back her opponent with speed and accuracy. Ourahmoune, who won bronze at this year's World Championships, battled back to take the third and also produced a spirited performance in the final round. Both boxers celebrated at the final bell, but it was Adams whose arm was raised in victory after again impressing all three judges. "Nicky was counter punching and being patient, picking her shots wisely. "No fight in an Olympic final is easy. The margins aren't far apart, they are two elite boxers and it was a very good fight."